Each year more than 100 students choose to spend some time volunteering with the Spectrum Center in a variety of ways. GPS (Guidance - Perspective - Support) is a tool for LGBTQ and similarly-identified students to utilize as they are navigating their understanding of their identities. GPS mentors help provide mentees guidance with helpful information and resources, useful perspective of their own experience and support around identity development. 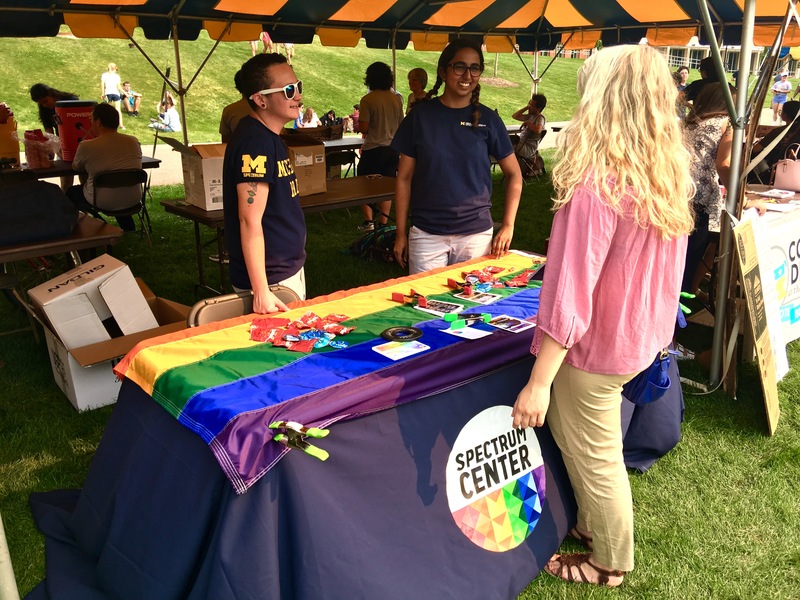 CenterSpace provides a monthly drop-in space for different communities within queer life at the University of Michigan. CenterSpace hosts help to create space for people of similar identities to gain support from one another while building a community of collective resources. Spectrum Center Programming Board is a volunteer leadership opportunity, with graduate and undergraduate students selected through application and interview. The Programming Board will plan their own LGBTQ events and support for all signature events including LGBTQ Welcome Festival, Trans Awareness Week, LGBTQIA+ Health and Wellness Week, and Lavender Graduation, among others. SAGE Metro Detroit’s Friendly Caller Program seeks to increase social connections and reduce social isolation among LGBT older adults. The Friendly Caller Program matches LGBT older adults with friendly callers for weekly calls to share in life events, hobbies, interests and to check in on their well-being. All older adults face significant challenges as they age, including social isolation. For LGBT older adults this issue is compounded by years of legal discrimination and the generational social stigma faced by LGBT people in historic and contemporary society, creating serious concerns for health and longevity. Volunteers are a huge part of our team, and we'd love to have you work with us! To sign up to be a Spectrum Center volunteer for the 2018-2019 school year share your information with us and we will connect with you soon!